And with that comes daylight savings, April showers, May flowers, Easter, and of course, a plethora of spring vegetables. One of our favorites is baby carrots and baby rainbow carrots! While carrots are grown and harvested year-round, they just seem appropriate to highlight this month because it’s the favorite vegetable of one of the most famous bunnies ever – the Easter bunny. Harvest Sensations is a grower-direct importer of baby carrots and rainbows from Guatemala and Mexico and we also source from growers in the U.S. They are a specific variety that is picked, peeled, packed for consistency in size, and sold to our foodservice distributors ready to use. Baby carrots and rainbows are colorful, sweet, crunchy, full of nutrition and are so versatile in the kitchen used raw and prepared. 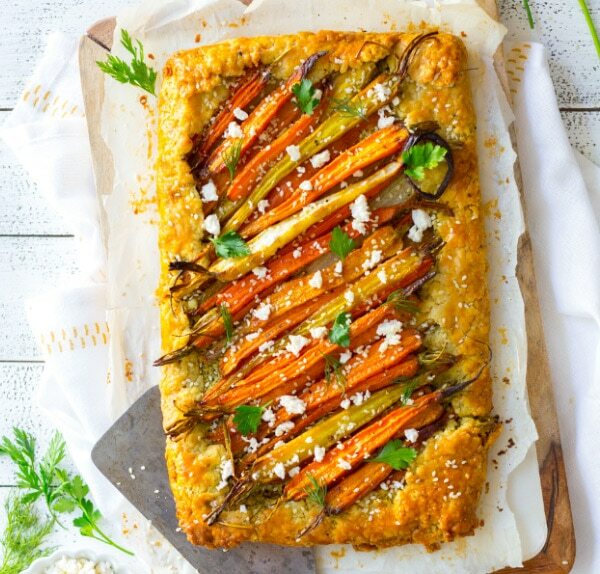 Simply roasted with olive oil and salt and pepper is a staple in many restaurants but for the adventurous operator taking advantage of the plant-based movement - there’s carrot soup, and carrot salads and carrot muffins and… Roasted Carrot and Herb Feta Pastry. Wait, what? Yes! It’s our featured recipe this month. We hope you enjoy it. And Happy Easter.